This article originally appeared in the Journal Inquirer, a newspaper out of Manchester, Connecticut. 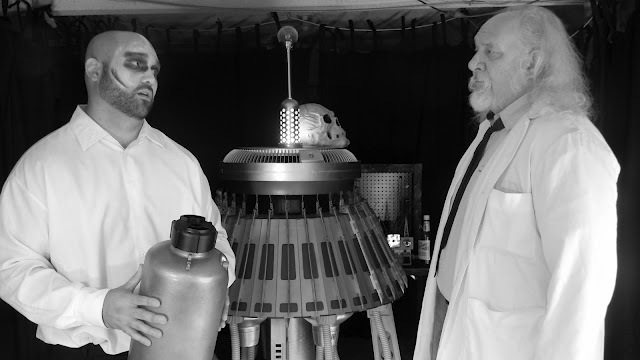 Torj (left), played by Ed Gasiorek, meets with his master, the evil scientist Dr. Harry Housen , played by Andrew Wrobel, in front of the atomic pile used to conduct Housen's experiements in the B-movie spoof Attack of the Atomic Zombies. Zombies are taking over the Old Town Hall Saturday as local composer-turned-filmmaker Tony Diana hosts the debut of his first movie, Attack of the Atomic Zombies. Diana, along with his two friends, created Butterfleye Films to pursue his passion for movie making. The trio developed the zombie movie as a spoof of black-and-white B-movies of the 1950s, he said. The premiere starts at 6 p.m. at the Old Town Hall, located on Route 19 near Hydeville Road, and costs $5 to get in. The cast and crew will be present to answer questions and sign autographs. DVD copies of the movie will be on sale for $10. Attack of the Atomic Zombies was filmed exclusively in Stafford and features an almost entirely local cast of actors, including Diana’s wife and daughter. The film’s plot centers around an evil scientist named Dr. Harry Housen who comes to town to conduct experiments and then dumps atomic waste into the Stafford water supply. When residents drink the water, they are transformed into atomic zombies. Diana’s zombie’s don’t attack or bite, though. They loiter more than anything, he said, which was designed as a parody on small town life. The production company had a limited budget and all-volunteer talent, so Diana, who freelances full-time as a composer and digital editor, used his computer editing skills to enhance the film and make its ‘50s setting look more realistic. In one scene, he superimposed a 1950s Chevrolet Bel Air in a parking lot, and in others he digitally removed cars or objects that looked too modern. “The computer opens up a whole bunch of possibilities,” he said. The movie’s dialogue is also unique, Diana said, because none of the lines were scripted. Rather, Diana wrote a synopsis of all 23 scenes and let the actors improvise. “They knew what they had to do in the scene but not what to say,” he said. Many of the actors were familiar with improvisation, but some were new to the craft. When the cast viewed the film for the first time in November, they were relieved at how well the movie turned out and how hilarious the dialogue was, he said. All three members of Butterfleye Films worked on the production. Diana wrote the film’s music and synopsis and did visual effects. Brian Thone made all of the props, including Dr. Housen’s nuclear reactor, and did zombie makeup. Steve Bednar helped create the film’s concept and plays Sheriff Ed Wood, the story’s hero, on screen. The trio is already busy making their second film, which Diana said will be more dramatic and ambitious than the comical zombie spoof. He hopes to someday make movies full-time and to work with a consistent group of friends and actors to pursue his “intense passion” for filmmaking. The movie’s runtime is 71 minutes, including trailers. It was filmed in early September over three weekends, and Diana spent five weeks editing and adding special effects. After the special Stafford showing Saturday, Attack of the Atomic Zombies will make an appearance at Boston Comic Con in April. For upcoming event information, visit the film’s website, http://aotaz.necromare.net.